Once you’ve booked your stay we’ll email you full directions. If you’re using sat nav, use GL50 1HQ (not the apartment postcode, which takes you to the wrong side of the building). The apartment is at the rear of the building, approached via Regent Street, then County Court Road. GL50 1HQ takes you to the Everyman Theatre, which is around 100m from the apartment. Drive past the theatre, turn left into County Court Road (which is a cul-de-sac) and to the right of Costa Coffee. The apartment is above Costa, and the door is at the rear. Free private parking is located immediately outside the apartment, secured with a lockable post. 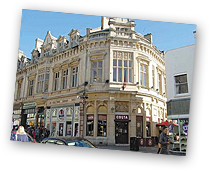 From Cheltenham Spa station, the apartment is a five to ten-minute taxi ride, depending on traffic. Most buses stop at Royal Well in the centre of Cheltenham, which is a short walk from the apartment (around 300 yards).